Well, things have finally slowed down for Christmas. 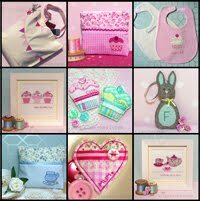 My final last-minute orders were sent out yesterday and my online shops are 'on holiday'. I have some new designs and products to share with you in the new year but in the mean time I thought I would share a few of my favourite things with you. I plan to do a post like this every now and then to share my favourite textile designers with you and am starting with the following three as designers I have admired for many years. First up, Belinda Downes. 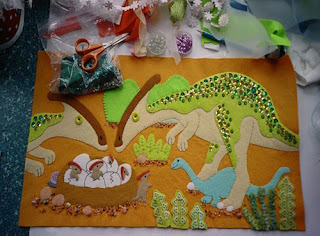 Belinda produces beautiful embroidered, hand-painted and appliquéd book illustrations that I have long admired. Such wonderful attention to detail and delicate images that work really well in print. This summer I also came across her fantastic greetings cards under the label 'Paper and Cotton Ltd'. 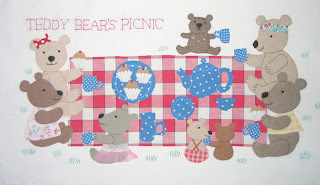 Of all the textile illustrators I have come across Belinda is definitely one of my favourites. 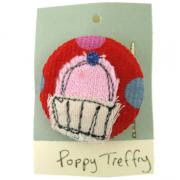 Next up is Poppy Treffry. 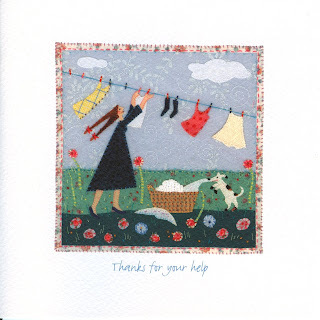 I love Poppy's relaxed hand-drawn style and have been a fan of her work for many years. It is wonderful to spot her products in so many fabulous stores such as Liberty in London. 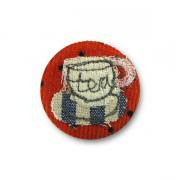 There seem to have been lots of textile badges around this year at the various craft fairs I have visited but my firm favourites are still those by Poppy Treffry which I first discovered several years ago on one of my many visits to the Eden Project in Cornwall. 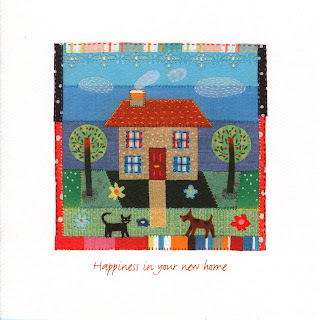 And finally, Clare Beaton, another of my favourite textile illustrators. I am not sure exactly when it was I first stumbled across Clare's work but I have been enjoying her gorgeous children's book illustrations for quite a number of years now and must admit I have a growing collection of her books! Clare's embroidered and appliquéd illustrations are always so cute with lots of lovely trims used for texture and detail. I love all her little finishing touches. Well I hope you enjoyed seeing some of my favourite designers and look forward to discovering more in the new year. Merry Christmas to you all and thank you for all of your wonderful support this year. I am having a Christmas giveaway on Facebook. 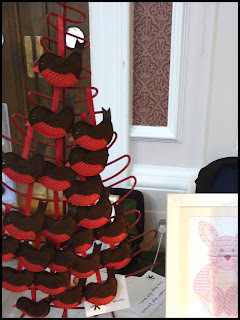 Pop over to my page for a chance to win one of my cute little Christmas Robin decorations and a Christmas Pudding card. 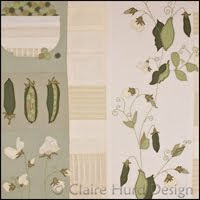 Claire Hurd Design Facebook page. AMENDED 13th Dec. 2009 - We have a winner! Congratulations to Julie Davis who was randomly selected using 'Random.Org' as my Christmas giveaway winner. Your prize will be on it's way to you very soon. Thank you to everyone who entered. The kind comments and messages you sent were lovely and a real boost. I am back! It has been a while as I have been very busy keeping up with online orders and preparing for the Handm@de Cambridge Christmas craft fair. costs and made a healthy profit on top. 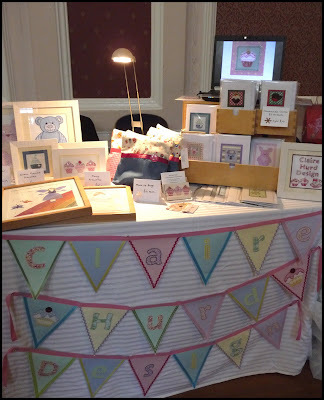 It was lovely being able to chat with my customers and I received lots of really positive feedback on my products which was very encouraging. I was also able to catch up with some familiar faces from the Winchester and Oxford fairs. Through the Handm@de craft fairs I have met some really lovely fellow designer/makers and it was wonderful to chat about crafty things and share hopes and dreams with people working in similar fields. I particularly want to introduce my blog readers to the following people - all truly lovely, very friendly and creating beautiful products. Julie of 'Little Button Nose', Karen of 'Chalk Hill Studio', Karen of 'Hodge Podge Arts', Cath of 'Emerald Framing', 'Twinkly Spangle', Natalie of 'Nat's Nest' and Alice who organised the event. It was wonderful to meet you all and sorry if I have missed anyone!